Tomato and Tea seemed to have pretty mixed results. I think there is a tremendous number of possibilities with these two ingredients, especially with tea. Black tea has a bazillion different varieties, which: can be used to smoke, can be steeped into a liquid, added to a crust or rub, etc. The soup is smooth, tomatoey, smokey, and pretty tasty. I'd like to play with the balance of flavors just a bit, because I'd like a little more depth with the clove and anise flavors. They're kind of swallowed up in the smokey tea taste. This is very satisfying for a first pass, though. The crostini are also tasty, but there's really not much tea flavor to them. I'm not quite sure how I'd play with that to improve it, but they taste good as it is. I didn't think about it at the time, but I should have saved the soaking liquid -- it would have made a fascinating vegetable stock. 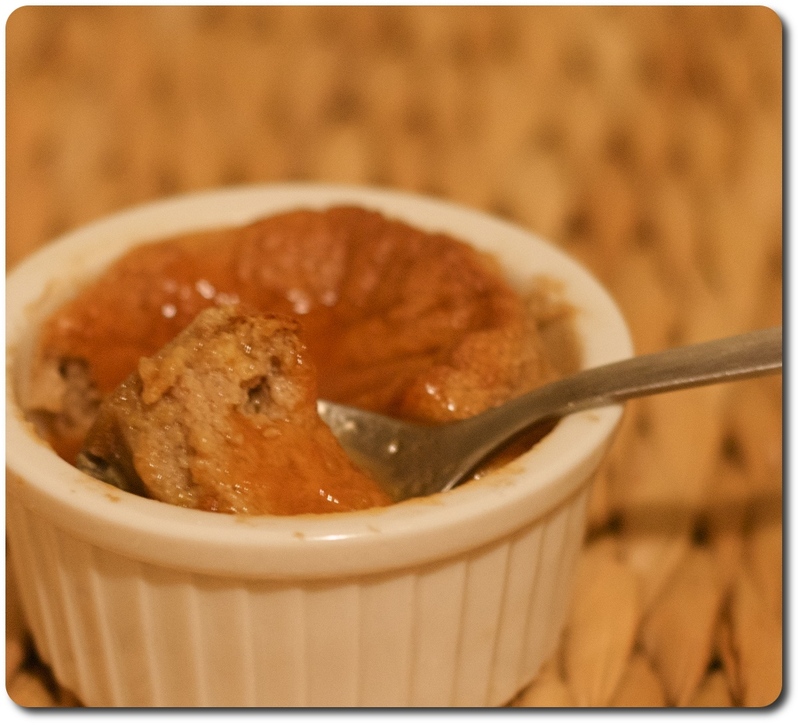 The souffles tasted really good (pretty much like tapioca milk tea in a warm and fluffy form), and so did the sauce (tartness of the plum, sweetness of the tomato). And did TGRWT? Overall, I thought this was an eccentric but successful pairing. When I first smelled the tomato and black tea together, I thought it made sense--it reminded me almost of a tomato and herb combination. Implementing it was more difficult, but nonetheless, I thought the bold and earthy black tea was offset well against the sweet and tart tomato-plum combo. The tomato here showed off its true "fruitiness", being treated as such in the puree, but it also kept its distinctive "heartiness" in the aftertaste. Anu Hopia, Elli Laukkanen and Kristiina Niemi over at molekyyligastronomia went to the bar to make us a tea infused bloody mary. 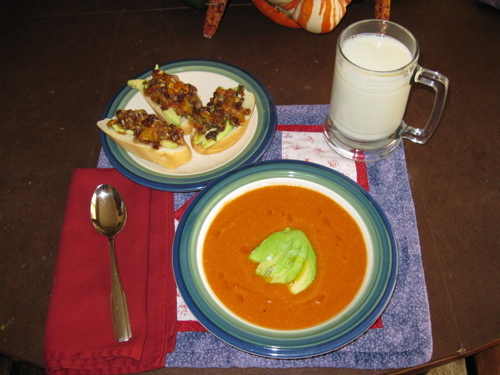 Tea and tomato worked well together & tea made tomato smoothie flavor rounder and also more complex. 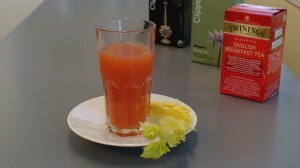 This is actually a nice version of Bloody Mary for those who prefer lighter drink for a change. The tea flavor was not too strong: if one does not know about the tea, it would be difficult to identify it from the smoothie. However, as we compared smoothie with hot water only, the difference was obvious and it was not difficult to pick the watery version out. The acidity decreased and the tea versions were significantly less acidic. First I simply sliced the tomatoes. Before taste testing them with tea I tasted them plain, with soy sauce, and with a blend of soy sauce and sugar (just a tiny tiny bit, don't tell!). Then I tried sprinkling the instant tea powder on the tomatoes. I didn't really like the results at this point, but I had a subtle sense of what this pairing could turn into. At this point I dumped the can of tomatoes into the Vitamix machine (a food processor or blender would work as well) with a heaping teaspoonful of the tea powder. Gave it a whir. Guess what! That was IT! I really liked the results, the tea really did enhance the tomato flavor. 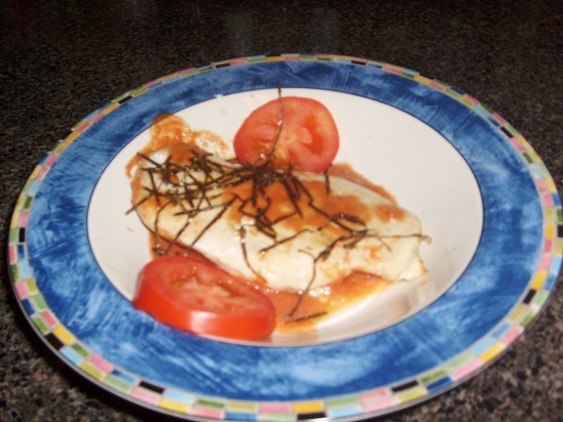 So I served it up with my piece of chicken breast, added some nori flakes and sliced tomato for garnish - it was tasty! Even if I were not on the diet from hell, I don't think I would want to add anything else to this sauce, but I think it might also go well with meatballs and pasta. 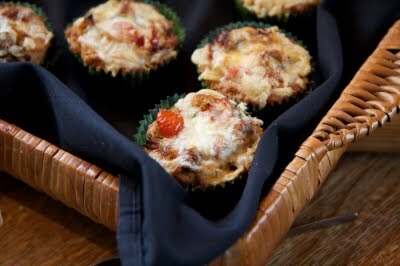 The Finnish blog, Sisters Cook, rocked it out with a Rukiiset tomaattimuffinssit black tea. I am pretty confident tomattimuffinssit means something akin to "tomato muffin". Was it then the black thanks to the tea or not? I think it is a bit difficult to say what proportion of the black tea is a taste of the end. Although the first to separate the black tea properly when the mouth is full of muffaria, after taste is clearly yes black tea aroma. [...] Maybe Assamissa would have been even more taste and half-dried tomatoes would have emphasized better than this sekoitelmani fresh and sun-dried? Details on the lasagne: I made my own lasagne noodles using the pasta recipe from _La Tavola Italiano_, and throwing in a bit of homemade pesto. So much for simple! The pesto didn't seem to add much flavor, but the pine nuts certainly added to the texture of the noodles. After spreading a thin layer of the tomato sauce on the bottom, I spread out a layer of noodles, a layer of ricotta thinned a bit with the tea so that it would spread easily, a thin layer of mozzarella, and a grating of parmigiano, and then the next layer of pasta et seq, ending with a layer of pasta, the bulk of the tomato sauce, and another grating of parmigiano. All told, it was about two eggs-worth of pasta, a pound of ricotta, a pound of mozarella, and a fair amount less parmigiano. The lasagne I served at the dinner party was rather disappointing. The lasagne as a whole lacked depth, possibly because I didn't bake it long enough or because I served it too soon after baking. The leftovers were much better. The sauce tasted like -- well, roasted tomatoes, but the sauce never did develop any depth. The tea didn't seem to have any impact at all. I made a vietnamese-ish summer roll, steeping the rice vermicelli in pot of a smoky tea (I think it was Lapsang Souchong). Then I took the tomato and just julienned it and rolled it up in rice paper with some fresh herbs, the tea infused vermicelli, and some fried tofu. The tea infused vermicelli was nice, didn't necessarily feel any benefit for having used the tomatoes, or synergy with the tea. Also, not super inspired, but I was crazy exhausted. By the way — I took my leftover crostini mixture, put it on some pita breads, and topped with red onion and shredded fontina. Baked it off in the toaster oven for some *fantastic* mini pizzas. This was a lot of fun… thanks for hosting! I’m hooked, looking forward to the next one. Nice dishes everybody. I had planned to join in for this round but time was not on my side this month and I didn’t get it done. What an absolutely hilarious translation :) Google does not compute Finnish very well, but I cannot blame the poor thing. Sorry about the Finnish, I was not originally posting it for this race… Just tried the combination out of curiosity… I am very taken by your attention!